Well, this is unexpected. HitFix has a brief interview with Cameron Crowe (director of Almost Famous and Jerry Maguire) and he mentions considering a sequel to the 1989 classic Say Anything from time to time. Of course, this isn’t confirmation that he’s got a script, or even a solid idea as to what the sequel would be about, but any film developed by Crowe is newsworthy. 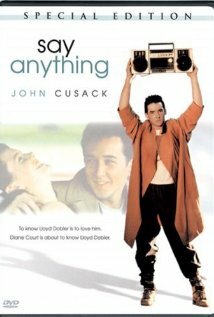 Aside from Jerry Maguire, Almost Famous*, and Say Anything the auteur has made Singles, Vanilla Sky, and Elizabethtown. All of these films are worth checking out, Crowe has a deliberate touch not often found in contemporary film making.He is currently filming We Bought a Zoo, which stars Matt Damon as the patriarch of a blossoming family who move to southern California and renovate a struggling zoo. We Bought A Zoo opens December 23rd 2011, we’ll keep you posted on that Say Anything sequel. Comments for Cameron Crowe Considers a “Say Anything” Sequel are now closed.